Over the last few years, The Hackers Paradise has been a little critical of the Cleveland Hibore Series of woods. We enjoyed the hybrids tremendously, but always thought the woods were a little more bark than they were bite. With the release of the Cleveland Monster, they have changed things up, but it was one driver that was not really on our radar of “Must Try” for 2009. But when it arrived it changed our attitude a little bit and we were glad that we were able to put it to the test for a good couple of weeks. We contacted Cleveland about reviewing a couple of other pieces of equipment and they were kind enough to grace us with adding this driver to the list. We spoke to them in detail to learn a little more about the Monster and what makes it special. The new HiBORE Monster XLS driver is ClevelandÂ® Golfâ€™s latest addition to the HiBOREÂ® family of woods. Available in a Standard, Tour or Draw model, the new Monster was designed to meet the USGA legal limit dimensions. Boasting a face that is 16% larger than its HiBORE XLS predecessor, the new HiBORE Monster XLS utilizes Distance Driven Geometryâ„¢ by lowering the crown, which in turn, lowers the center of gravity (CG) to produce the only face-centered sweet spot in golf. This latest driver offers golfers of all levels the benefits of Full-Face Performance (FFP), which is driven by a face-centered sweet spot and a more efficient energy transfer to the ball. The HiBORE Monster XLSâ€™ larger face has allowed its sweet spot to be expanded, while an additional 24 grams of perimeter weighting has enabled it to reach maximum moment of inertia (MOI) for ultimate forgiveness and stability. Beyond the head design, the longer, lighter Fujikura Fit-On Flightspeed shafts lead to higher swingspeeds and additional yardage to make the new Monster the ultimate in geometric performance. When the delivery arrived from Cleveland Golf a few weeks after we had spoken to them about the Monster, we were glad that they included it. Everybody in the THP offices enjoying this unboxing. One thing we all agreed on was that Cleveland created a very nice looking club and one that we were definitely looking forward to trying out. The bottom of the club says MOI and then goes into the word Monster, and we absolutely loved that. Just something a little different that adds some pizazz to the club. One thing I want to touch on before we get into the testing we did is that THP wants to thank Cleveland Golf for making a headcover that has the three things we want in each one. First, it looks good. That is very important to us. The white with the contrasting bright colors make the Monster stand out in any bag. Second, it is functional. It protects your driver as just about all headcovers do. Third it is easy to get on and off. 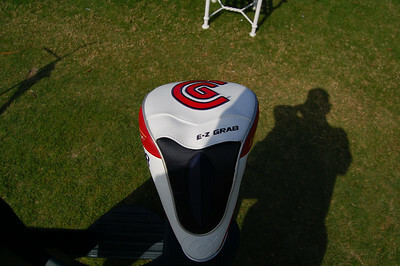 The E-Z Grab feature makes it easy to pull out of the bag and to pull off the driver. It is amazing to us how many companies still do not make headcovers that have all three of these traits and we applaud Cleveland for pulling it off. Sometimes it is the little things that we here at The Hackers Paradise get so excited about, and this was definitely one of them. Appearances can give us confidence in setting up and this definitely did just that, however readers of THP know we are all about real world testing, and this review will be no different. We called THP Resident Pro Andy Mollerud into our office and asked if he was ready to “unleash the Monster”. The two of us headed out to the local range and grabbed a large bag of balls. We warmed up a little with some wedges and then it was time to hit this new driver. The range was full that day and we were all the way on one side. Our local area holds about 30 people and it was jam packed. Our pro went first and with one swing the entire range and myself thought someone had hit a ball through broken glass. Every single person stopped what they were doing to see what the heck we were hitting. THIS DRIVER IS SERIOUSLY LOUD! The two of us pummeled through the bag of balls and marveling at what would come first. Would we clear the 300 yard mark, or would we go deaf trying? Here is a sample video of the sound of this driver as Andy hit the Monster. After our brief range session we came away with some early thoughts. The Monster has a very hot face and the balls travel quite far. 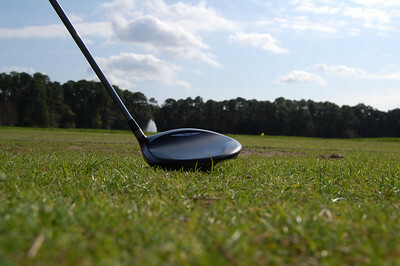 It is also one of the most forgiving drivers we have ever tested. Our shot dispersion could not have been more than 10 yards apart and even on mishits, the balls traveled long and straight. Have we mentioned that it is VERY LOUD? 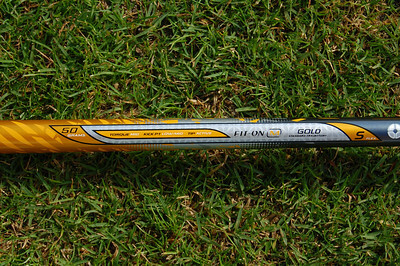 We also really liked the shaft choice that Cleveland made with this one. Using the Fujikura Fit-On with an active tip in a shaft that weighs 50 grams made this driver feel as though it was swinging itself. The next day I took it out for a round and each member in my foursome also played this new toy. Each player had the same exact thoughts. MAN IS THIS LOUD. But also, how easy the ball got up in the air and how even on toe and heel mishits, the ball was still flying as straight as if you had hit it dead center on the sweet spot. On the course we were playing we pulled up to hole #13 and the tee box is tucked away in a secluded area that is covered with trees. The first swing with this club and it was terrifying at just how loud the Monster is. But the results were all the same. Each of the four of us found yet another fairway. The following week the Cleveland Monster was taken to the masses. We brought it to a busy driving range on a Saturday afternoon and the place was jam packed. Their must have been about 70 golfers out there and we were able to get a real sampling of what others would have to say about this new driver. One by one we asked people to hit it and the results left two groups of answers. The first group hit one ball and heard the driver and did not want to continue. The second group hit the ball and said “who cares about the sound when the golf ball travels like that”. We fit into the second group. Most of the golfers that we worked with out on the range were quite happy with the results. But there were a select few that the sound was just too much for. Overall we liked the Cleveland Monster quite a bit. If we have not said it earlier, this driver is loud. But in the end, long and straight is what we are after and with this driver in your bag, those results are definitely achievable. The Monster will be available in Standard, Draw, and Tour models. It is available from 8.5* to 11.5* with two of those being made in Left-Handed as well. 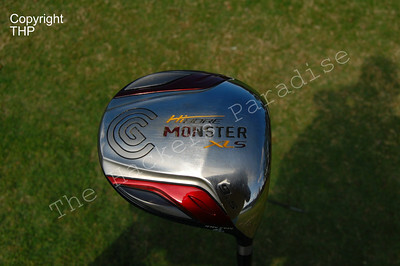 All three Monster driver models will carry a street price of $299 and begin shipping January 29, 2009. 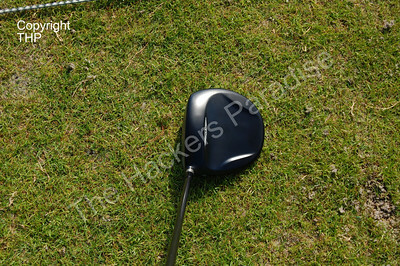 For more information on this driver and to get all the technical specs visit Cleveland Golf Monster. Very interesting info. 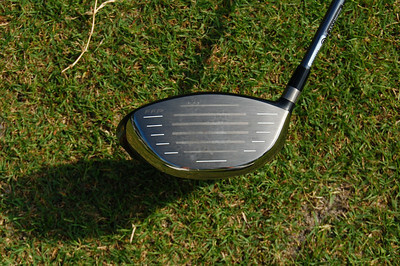 I play the old Hibore XL and am in the market for a new driver. This one will definitely be on my list now. I did not like last years model, but I remember you saying you did not either and this one seems pretty hot. Sound does not bother me, so this is a keeper perhaps. That video is awesome. Wow what a crack! Great info. Looking forward to trying one of these out. Nice review, sound doesn`t bother me either all about performance. This thing looks cool. I love the video in the review. As usual, you guys still do the best reviews of equipment on the net. I cannot wait to demo these. Very cool review. I play the XLS and am not thrilled with this. I was going to go a different route until I stumbled across this review. I will have to hit it before making my driver decision. Very cool. Nice article. Im of the same mind set where who cares how loud it is when it goes that straight and far. Ill have to go hit this. I think this is the driver my hubby wants me to pick up for him. He read the review this morning and said “I must have this”. So thanks for that. Great review as always, JB. I’m probably less forgiving of a loud driver, as I hit the Nike Sasquatch Sumo2 and could not stand the noise it makes. But for anyone that doesn’t mind a driver with a loud bark at impact, this sounds like a must-try! Another vote for this driver was not on my radar until reading this. You guys have the ability to make your reviews so personal, I feel like I just hit the club myself. Excellent review, I will be taking the Monster for a test drive before I make a decision on a new driver. I don’t think the sound will be a problem for me. The added video was really cool. It sounds really loud. But Im with the readers. Long and straight is what you need. Great read. I was not really in the market for a new driver until a few weeks ago and this one just jumps out at me after reading this. Cannot wait for them to be ready. Fabulous write up. Just found this site and it is a good one. Never knew they were making this one, only the launcher but this one peaks my interest. I think this driver is exactly what I am looking for. Like the writer I did not like any of their previous models, but am not holding a grudge and look forward to trying this one. that thing is loud. I am playing the XLS from 08 and like it a lot, but the one thing it is missing for me is getting it up in the aire fast. it seems when reading this one that nobody really had a problem with that. I think it will have to be on my list to test out. I got to try this today and I must say, it is exactly like the reviewer says. Now I am going to buy one when I get paid. Thanks for your help THP. Cannot wait to try this out. Wow that sucker is loud. It must be even louder in person because Cameras usually dull out the sounds of drivers. great review. i especially liked the video. im gonna have to try this one out. loudness doesnt really bother me, and i love to hit it straight. so this one is now on my list. thanks! I picked up the Monster Tour a few days ago. In America, louder is better. No need to yell fore. This will get everyone’s attention ahead of you. Best review on the web… and I’ve been searching. I just got to demo this club and the new Launcher on the range. I play with an old Launcher 330 that I hit well, but I want more distance (it’s time!). Going in, I really wanted to like the new Launcher better than the Monster, but I hit the Monster consistently better. The ball goes a long way and straight when hit well, and pretty well even on mishits. And the demo wasn’t even the right shaft for me. If it weren’t for the awfully loud sound, I’d have bought the Monster right there, but I didn’t want buyer’s remorse. I’m going to give it another test drive on the range and if I like the results again, I’ll likely buy it even though I anticipate a lot of ribbing from the rest of my group on the course. I just hope I don’t damage my hearing with it (seriously). Tested the new Monster XLS today. I really liked it! If you have a tendency to not hit the ball straight this one is a winner! Had it for two weeks. Hit it so well…I thought I could live with the loudness. However, after 54 holes in three days, I can’t do it anymore. Despite how straight and great it hits it, I have to give it up. My ears physically hurt right now, and I am having trouble hearing conversation when there is background noise. This club is not worth permanent hearing loss. Contacted Cleveland, and they say there is nothing they can do. You’d think they could add foam or something. It is a shame…but look for mine on Ebay. just bought one and i can tell you its money well spent!! as for the the noise it makes….. it sure is a head turner to say the least, but for me personally its satisfying as i have a fast swing speed and the noise you get on impact is a real feel good factor, combine that with the distance you get from the thing and you really do feel like you have a monster in your hands …. excuse the pun. I’ve been playing the Hibore XL for about a year and a half. Recently I ran across a Cleveland tour van at a local driving range. I had previously hit the 2008 XLS and didn’t like it, mainly because it was so much louder than the XL. After reading Golf Digest’s review of the Monster I really wanted to give it a try. The fitters on the van obliged, and more importantly had Trackman radar set up to monitor your results. I first hit my XL to baseline and with the Monster I gained a consistent 15 yards or so, probably due to the lower spin rate indicated on the radar. It wasn’t as loud as the 2008 XLS to my ears, so I’ll be picking this driver up as a replacement for my XL after the prices go down some. PS: Last Sunday after playing an entire round with my XL, I teed off on the 18th hole with a 2008 XLS that I borrowed from a guy in my foursome….I was absolutely shocked by how much louder it was than my XL….glad I didn’t buy one. I purchased this driver in late November and can’t say enough about it. Its real forgiving, and real long. However, it is LOUD. I’m not bothered by it, but when you go to the range. People will turn and look after the first hit. Holy crap! I’ve been eyeing this driver for a while (have the original hi-bore). It finally came down in price to $150. It’s AWESOME!!! First round playing with it I instantly added 20 yards on average to my drive and even pounded out a 300 yarder on one hole. The forgiveness is amazing on mis-hits. I love the look and the sound – you’ll even get intant feedback from the sound when you mis-hit it even though the ball still goes 230 yards and 20 yards off center. I just traded in my old HiBore XLS for this driver and gained about 15 yards. Love it….loud? Who cares as long as it’s in the fairway and I have a long walk to my approach shot! Love it!! !